Operation Thunderbolt, the 1976 mission launched by the Israeli Defence Forces Special Forces division in the to rescue hostages being held by the Popular Front for the Liberation of Palestine at the Entebbe Airport in Uganda was something of a gift to opportunisty film production companies of the time. It had everything – personal drama, conflict, armed bad guys, no-nonsense good guys, daring and co-ordinanated military action. That's assuming, of course, that you were not sympathetic to the Palestinian cause, which a good many were. The incident gave birth to three film dramatisations in the space of the following year, two of them American made-for-television movies, on the product of Israeli cinema. First up was the 1976 Victory at Entebbe (sure the title gave the ending away, but few who saw it would not know that anyway), which featured an all-star cast that included Anthony Hopkins, Burt Lancaster, Elizabeth Taylor, Richard Dreyfuss, Kirk Douglas and Linda Blair. Thrown together at an unhealthy speed and boasting production values that few would describe as plush. In 1977 the Israeli feature take on the incident, Mivtsa Yonatan (released over here as Operation Thunderbolt), made its way into UK and US cinemas, but between those two films was a second US TV movie, Raid on Entebbe, and the general opinion is that it greatly improved on its hastily made redecessor. In 1976 four members of the Popular Front for the Liberation of PalestinePopular Front for the Liberation of Palestine hijacked an Air France plane, diverting it to Entebbe, their cause being to secure the release of militants in Israel and four other countries. They held the hostages captive for three days before releasing a large number, but kept 100 passengers who were Israelis or Jews on board. The story follows the Israeli Cabinet's decision to launch a top-secret military raid to free the hostages and the tough and daring operation that ensued. Directed by Irvin Kershner this Golden Globe winning film features a stand-out cast that includes Charles Bronson, Martin Balsam, John Saxon, Robert Loggia, Yaphet Kotto as Ugandan president Idi Amin, and Peter Finch in his final role (he died just weeks after finishing the film) as Israeli Prime Minister Yitzhak Rabin. 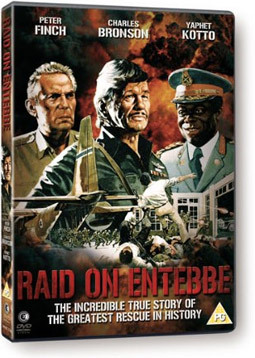 Raid on Entebbe comes to UK DVD for the first time on 26th March 2012 from Second Sight at the RRP of £15.99.